There are only two flavors of gameplay in Galak-Z: stressful, and unbearably stressful. For all of the whimsy invoked by this candy-colored ode to retro mecha anime the gameplay is pretty damn unforgiving. Plan A is to master the steep learning curve of the precise controls required to dominate combat; Plan B is to become good enough at stealth to avoid said combat; Plan C is to throw your controller across the room. Galak-Z is a love letter to both classic 2D games and 80’s mecha anime in the style of Gundam and Macross brought to us by Seattle-based developer 17-Bit. From the music to the colors to the more than slightly stilted voice acting the game will immediately warm the heart of anyone who has an eternal soft spot for cheesy mech anime. 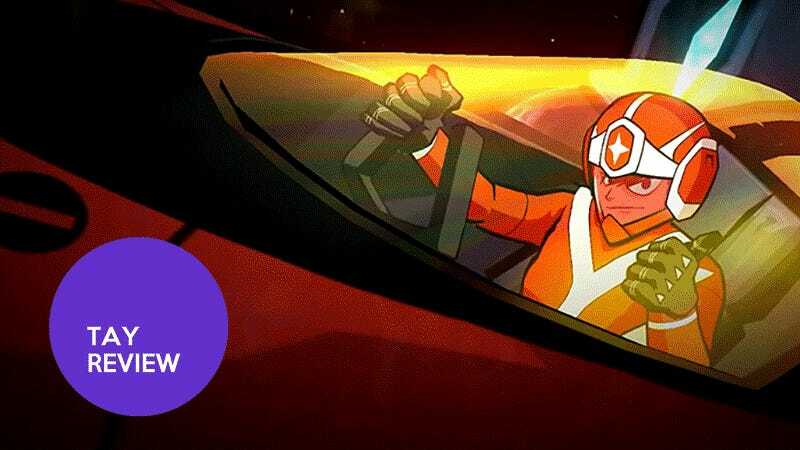 You play as rookie pilot A-Tak, helmsman of the experimental fighter GALAK-Z, who teams up with the remaining crew of the USS Axelios to battle against alien imperials, pirates, and space bugs. This physics-based hybrid of a roguelike and an Asteroids-style shooter is organized much like a TV show into seasons, each consisting of five randomized levels. At its best Galak-Z is a tense and exciting foray into the space opera genre; on the flipside it can be a punishing experience for those not committed to conquering the nuances of the gameplay. It would be impossible not to start with the style of the game because - make no mistake - this one’s got charm in spades. Every corner of Galak-Z signifies its devotion to the look and feel of vintage mecha anime, from the hand-drawn art style to the animated character portraits to the VCR static lovingly rendered on the pause screen. The exuberant style extends to the sound design, characterized as it is by an array of thrusters and lasers intermixed with heavy synth and base to produce a fun retro-cyberpunk hybrid sound. Sure the whole feel of the game is based on anime archetypes, but 17-Bit manages to pull the whole package together with flying colors. As unforgiving as the gameplay can be Galak-Z always offers a number of ways to get past each obstacle. Intelligent enemies adapt to to the player’s moves, but the player in turn can use the opponents’ tactics against them to play enemy against enemy and use various environmental hazards to dispatch them quickly and cleanly. Conversely, stealth is always a valid option, whether to get the jump on enemies, soften opponents up by letting them fight one another, or sneaking past them altogether. Because of the intelligence of enemies and unpredictability of level layouts nothing about each battle is predetermined. Combat is not simply point-and-shoot, but heavily tactical and physics-reliant. It takes training and patience to adjust to the zero-g handling, and advanced maneuvers take some time to master. Success is reliant on skill, and the game rewards patience and practice above all else. It was inevitable - if you’re going to model your game after mecha anime, players are going to have pretty high expectations on that front. It’s telling that 17-Bit saved the reveal of the game’s “mech mode” for just before the game’s release, because frankly it’s … underwhelming. Don’t get me wrong, the very fact that you can transform from ship to mech in an instant, beam sword blazing, is pretty damn awesome and lends an additional layer of available battle tactics to the proceedings. That said, the mech’s abilities are fairly limited. Galak-Z has a fairly stiff learning curve, there’s no getting around it. It takes practice to learn how to exploit each enemy type’s weaknesses, to use the environments to your advantage, to use the game’s physics to master your ship’s full potential. But the real kicker is the way in which the game is structured and how failure is handled. The story is divided into seasons, each composed of five episodes. Fail in any episode? You get to start back from the very beginning of that season. The procedurally-generated levels ensure that replays aren’t as monotonous as they could be, but dammit is it frustrating. When this happens you may lose your progress but at least get to keep your upgrades within that season; conversely if you choose to use “crash coins” to start again from the same episode you’re stripped of all of your upgrades. Those upgrades will be scattered over the various maps for you to find on your next try, but in the meantime you very well may find yourself outgunned and forced to rely heavily on stealth to get through each level. The currency in Galak-Z is “salvage,” which is used to purchase upgrades and supplies from Crash, your local gunsmith. “Crash Coins” hidden throughout the various levels allow you to acquire bonus salvage. A fine system, except that there isn’t really a huge variety of power-ups to choose from. Additionally - and most frustratingly - your upgrades and power-ups are lost at the end of each season. The only thing that transfers between seasons are the blueprints for ship upgrades, which will appear in Crash’s shop. Okay, fine, I realize it’s silly to complain about the random nature of a quasi-roguelike game. But the potentially devastating side of the randomly-generated levels is that the power-ups found therein are also randomly-generated. Run into bad luck with what you come across and you may find yourself underpowered and totally unable to outclass your enemies. In a larger sense though, there isn’t too much of an overall progression in the game, either on a gameplay or on a storytelling level. Episodes and whole seasons aren’t terribly different from one another, meaning that after a certain point it all starts to blend together. Galak-Z is a shooter/roguelike mashup that derives most of its charm from the strong 80’s mecha anime vibe. The gameplay, while certainly offering a challenge, may not prove engrossing enough for many players to get through all seasons. The punishing way in which the game resets to the beginning of each season instead of each episode upon death also adds a perhaps unnecessary level of frustration to an already difficult game. If you’re a fan of unforgiving roguelikes or a devotee of this particular anime genre it may very well be worth your time; those who are easily frustrated or opposed to repetition may want to tread lightly. Nicole T (street name: Barkspawn) lives in California and perhaps doesn’t have the necessary attention span to get the most out of these types of games. You can find her on Twitter @ser_barkspawn, contact her here, and read more of her articles here. Header image by Tim C.